1. As you may have heard, Libby Lehman suffered a ruptured aneurysm on April 30th. Following surgery to repair the aneurysm, she had a stroke. She is improving, but this will be a very long recovery. Follow her recovery at CaringBridge where her family is journaling her progress. If you want to do a little more, please enclose a check with your card made out to “Libby Lehman Medical Fund.” Any amount will be appreciated even a few dollars. Or, click on the Guestbook at CaringBridge to leave an encouraging comment. 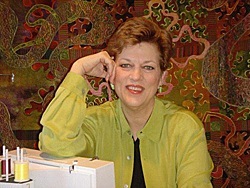 Libby has been an enthusiastic supporter of the Alzheimer’s Art Quilt Initiative. She has a very long road ahead of her. 2. John Flynn is the patron saint of the Alzheimer’s Art Quilt Initiative. He has supported us financially at International Quit Festival for the last 8 years and he has participated as a celebrity quiltmaker since the beginning of our November auctions. 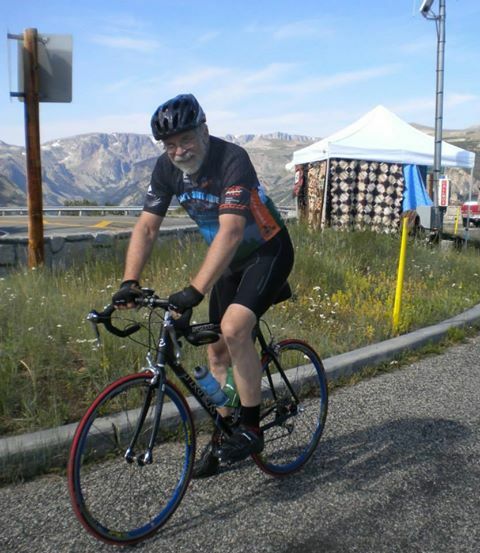 John is biking to fight MS this Saturday. John is the kind of guy who will give you the shirt off his back. Literally. He sent me his shirt! (I asked for it because I had this great idea of making a Priority: Alzheimer’s Quilt out of it.) Embarrassingly, I ran out of time. If you donate to John’s cause your name will go into a hat for a chance to win a quilt by John Flynn. After John pulls the ticket for the quilt, he’ll pick the lucky winner who gets the shirt of his back. 3. 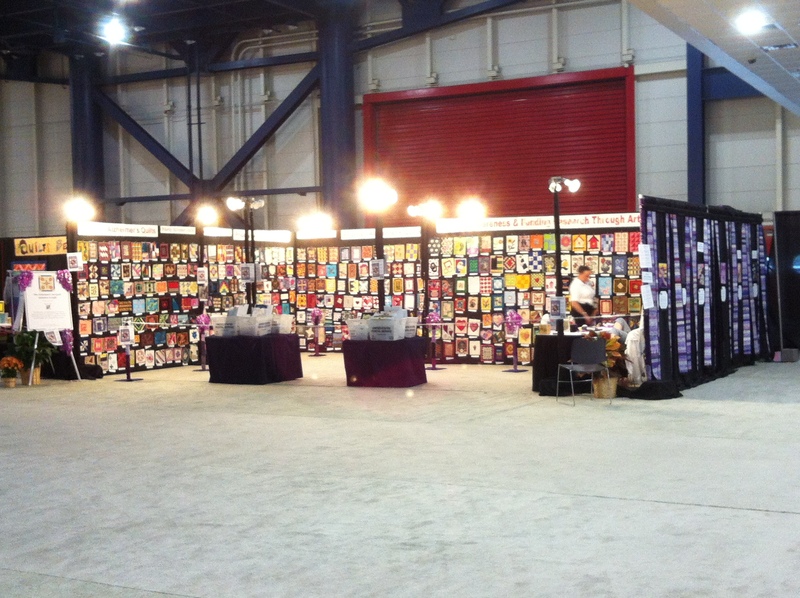 The Alzheimer’s Art Quilt Initiative is gearing up for Houston and it’s time to ask for volunteers to work the booth. We need six people for each time slot and more “in reserve” on our Text Brigade when we get slammed with customers. If you can help, read more on the AAQI Update Blog. John’s link is not working. Thanks for letting me know the link was busted. Love the booth set up! I hope you go home with an empty bag! (at least from your booth!….look at all those beautiful quilts to buy and take home and support AAQI ! Good Luck Ami with Houston and I hope you guys sell them all !!!! We hope we sell them all too! But if not they’ll be on the sale page when we get back. The article about Libby came to me at the perfect time. I am the recent recipient of a bad ankle break and was heading for a seat on my personal “pity pot” when I read about Libby. I hopped off my pity pot, put on a little make-up, and said to myself, “This too shall pass.” So count your blessings and hug your family. We miss you at AAQI, Ruthie! Heal fast! Thanks for the link for John’s ride. My brother had MS and was very brave about it. Wonderful work on the AAQI, my dad had Alzheimer’s and it was a hard time in our lives. Give Scooter a hug for me. Thanks, Rebecca! I appreciate your kind words and Scooter sends you tail wags and virtual kisses.